Corals/Plants: Narrow-leaf java fern, windelov, blyxa japonica, various crypts. Quote: Anything is possible as long as you have passion in your life. 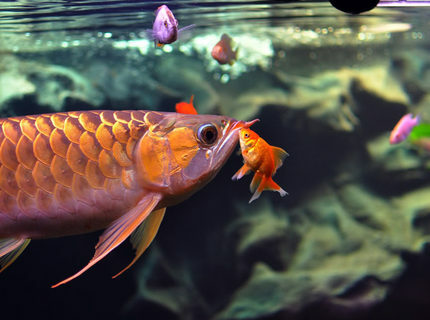 Fish Kept: In this tank Arowana, Cichlids, Clownloach and pleco. Advice: Dont trust anyone. Its a hobby. 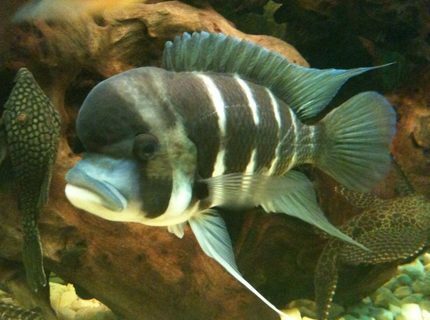 Fish Kept: African cichlid's from lake lake Tanganyika and Malawi. 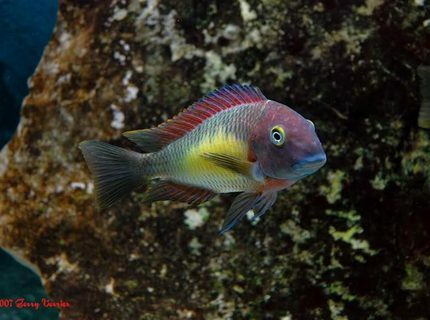 2Tropehis Moori, 2 Tropehis dubosi, 2 Tropheous kipili, 1 Electric yellow,1 malawi Eyebiter, 2 Demasoni, 1 Giraffe Hap, 3 Frontosa, 2 Auratus, 2 Kribenses, 8 Various Peacock. 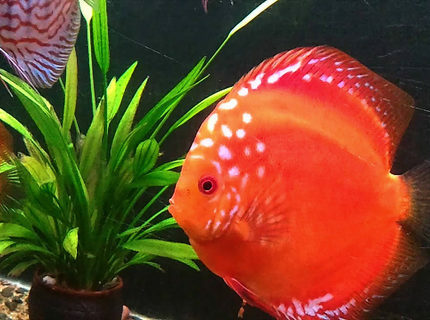 About Yourself: Started off with a 2ft tank and hear i am..
Corals/Plants: Cichlids end up destroying real plants,your best bet is artificial they still look as good. Description: King of the Jungle 7"
Quote: I reject your reality, and substitute my own. Adam Savage. 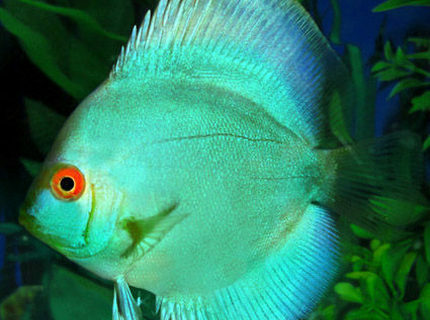 About Yourself: looking back now... my wife regrets giving me the green light. since that fateful day i have set up 5 tanks ( 1. 55gal 2. 72 bow 3. 30 long 4. 10gal micro reef. (now the 30 long) and 5. a 29gal neon set up for my son. she is a patient woman. 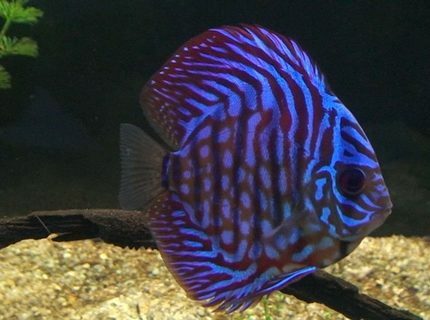 Fish Kept: discus, cardinals, bamboo shrimp, neon tetras (blue black and orange) cory cats, loaches, damsels, crabs.. I almost forgot, snails up the wazoo, and bristle worms. 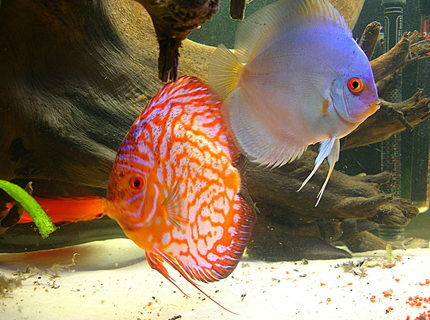 Description: the king and queen of my tank. unfortunately, both have passed. 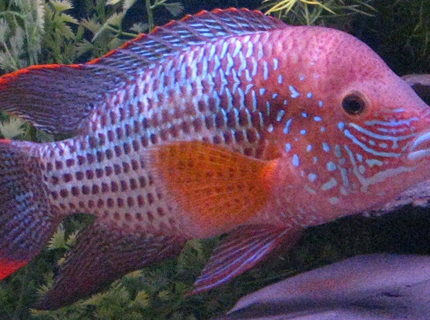 About Yourself: I have had many aquariums and many different kinds of fish. As I have tried on new varieties and have experienced their different ways of playing and caring for their brood, curiosity has only become greater. 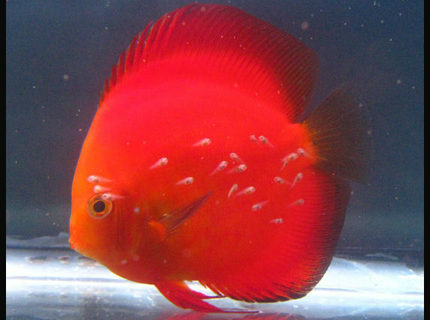 And now it is only Discus! 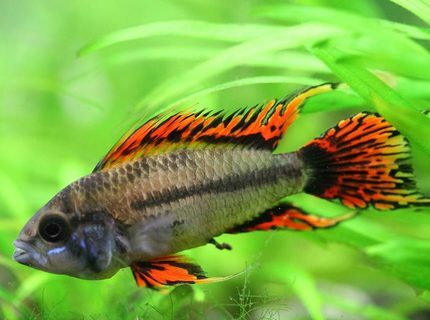 Fish Kept: 11 Discus ( 2 Blue Diamond, 2 Royal Blue, 1 Red Melon, 1 Golden Melon, 1 Rose Red, 1 Golden Candle, 1 Checkerboard pigeon, 1 Leopard, 1 Marlboro Red) 2 Ancistrus, 1 Gibbicept, 1 Platydoras costatus, 3 st Corydoras. Corals/Plants: Most only fabric plants.